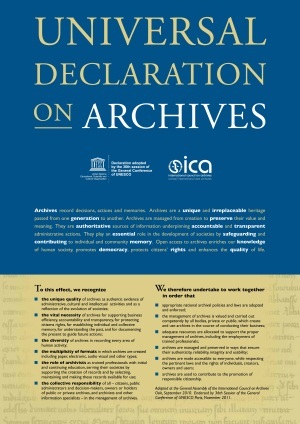 To raise awareness of the profession, the International Council on Archives (ICA) is enlisting the support of the public to promote Universal Declaration on Archives (UDA) by signing the UDA online register. The UDA has been endorsed by the ICA as a key pillar of its outreach and advocacy policy and strategy. Followers and supporters may also share the link to further publicize the Declaration. The UDA was adopted in principle in 2009 at the ICA Annual General Meeting in Malta. It was developed by a special working group of the ICA, the SPA (Section of Professional Associations), based on the model of the “Déclaration québécoise des Archives“. On 17 September 2010, the ICA unanimously approved the text of the UDA at their Annual General Meeting held in Oslo. On 10th November 2011, the UDA was officially endorsed by UNESCO and adopted by the 36th plenary session of the General Conference of UNESCO . The Declaration concisely outlines the unique characteristics of archives and the management requirements to provide ongoing records access. It has been conceived as a basis for advocacy and promotion to support archives and the profession, and addresses a wide public. Available in 25 languages, it is a statement of the relevance of archives in modern society and marks an important step in improving understanding and awareness of archives among the general public and key decision-makers. This entry was posted on August 1, 2012, 4:13 am and is filed under Announcements. You can follow any responses to this entry through RSS 2.0. You can leave a response, or trackback from your own site.